So, you’ve picked your destination. You’ve booked your flights. Now it’s time to decide on a place to call home during your vacation. Whether you’re staying for a couple of nights or a couple of months, there are a lot of benefits to choosing short term apartment rentals over hotels. While renting a whole apartment may sound expensive, it is often actually a lot more cost-effective than a hotel! Short term apartment rentals don’t have all the usual overheads that hotels have, so they are able to keep operation costs and rental fees down. 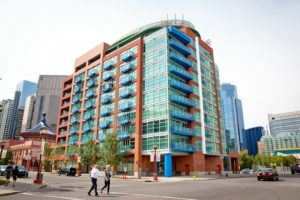 Where hotels have rigid pricing structures, apartment rentals have the flexibility to work with their guests’ budgets – especially on longer term stays. 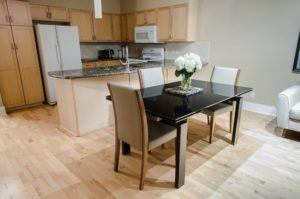 Not only that, short term apartment rentals also provide you with your very own kitchen to cook up a storm! You’ll be surprised how much money you can save by not dining out for every meal. Serviced apartment rentals offer the freedom, privacy and comfort of home-style living, with the added bonus of hotel luxuries, such as wifi, regular cleaning, and linen services. Having a space that’s totally your own will make you feel much more at home than in an impersonal hotel room surrounded by other travelers. Short term apartment rentals, like the ones offered on Urban Suites, are set up just like your own home with a fully-equipped kitchen, full-sized bathroom, and the convenience of a washer/dryer. This certainly makes keeping your routine while on the road much easier. When it comes to offering the most space, apartment rentals definitely win out this category. Where the average hotel may be one-bedroom or studio style, apartment rentals offer multiple rooms, including living area, kitchen and bathroom, as well as separate bedrooms for extra privacy. Perhaps one of the most rewarding benefits of short and long term apartment rentals is that they give you the chance to experience life like a real local in the area. Usually positioned in an authentic local neighbourhood, you can get a taste of the genuine culture and vibe of the city you’re visiting – rather than feeling like just another tourist. Most apartment rentals will offer a concierge service too; your very own local source of insider info! 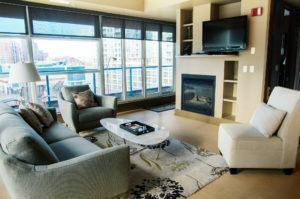 Want to enjoy all the comforts of home while on your next visit to Calgary? Check out Urban Suites. Renting nightly, weekly, or monthly, these stylish Downtown suites will have you feeling right at home.